Follow My Dream: Goodbye Ilissa, I love you! Goodbye Ilissa, I love you! We are on the road at 8:30, making good time despite the rain and traffic, our flight leaves at 1:30. Dan is stressed, he has a lot on his mind and just wants to get to the airport and get this process started. 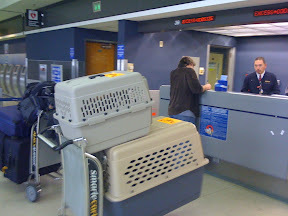 We need to drop off the rental car, assemble the dog crates (Baxter's is ginormous and we had to take it apart so we could fit everything in this Ford Explorer that we rented), get the dogs and luggage checked in, pay for the extra weight and luggage, pay for the dogs and wait for the plane to leave. Up at 6am, we said goodbye to Justin as he left for work. As we packed, Ilissa made sure we had everything we needed including love, good cheer, and hugs. I haven't seen her for 10 years and leaving her made me realize how much I missed her. I'm glad we made the time for a visit. She even sang a song to Lucy, her first favorite. "Lucy girl, in her Lucy world, doing her Lucy twirl. Ears like cottonballs (sung at a higher pitch) loves Baxter through it all" I'm gonna miss her! Once we got to the airport things went reletively smooth. 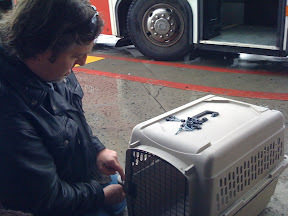 It was a total pain to assemble the crates in the car rental parking lot, in the rain, with 2 wet and stressed out dogs, 3 suitcases, 2 backpacks and 1 carry on bag. Once that was done, and the dogs were in their crates, a kind, lady, bus driver for Avis told us she'd be happy to take us. She made it clear to the other passengers that there were dogs on the bus and they were welcome to take the next one if they had a problem with that. She's a dog lover and was very careful and protective of her cargo. The guy checking us in at the airport felt sorry for us and all the fees we had to pay so he didn't charge us for our 3 suitcases, all of which were overweight! We grab some MacDonalds to eat on the plane and rush to our gate just in time for boarding. The man standing in front of us overhears Dan reviewing what we have to do when we land and learns that we are moving there. He just moved, with his dogs, 3 months ago. 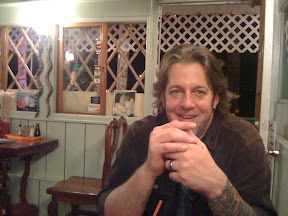 He is a director for commercials! He tells us they now have editors on set cutting dailies, hummm...possible job lead? He says we live by his holistic vet and has a 3 month jump on us so we say we'll trade numbers, but never get a chance. Lifting off, Dan and I look out the window. Excited, it's finally here, we'll be in Kauai tonight. As I look out the window, I see a double rainbow just behind the wing, I watch it, amazed, until we are swallowed by the clouds and it disappears. I settle in for the 6 hour flight. As we were nearing our new home, I opened the window shade. 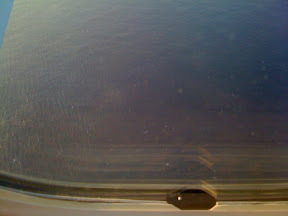 We were about 15 minutes from landing and about a half mile in the air, when I looked down to the ocean. I was litterally, littered with dolphins. Thousands and thousands of them. The closer we got to shore, the less ferquent we saw them. An auspicious beginning! The tiny white spots are dolphins. While we were in the air Sky, from ReMax called on behalf of Jimmy, the guy we're renting from. The house hasn't been cleaned, would you mind? Of course we'll discount the rent. I call her, Jimmy is on the mainland, his mom just died, the keys are at his house. While she goes there to get the keys we have dinner at The House of Noodles, off the main highway in Kapa'a. It's open windows covered with bamboo, cross hatched, "bars", let a cool breeze in. I can't believe we did it! WE LIVE HERE! While we wait for our food, Sky calls, none of the keys work, she called the locksmith, he'll be there in an hour. Perfect, we can take our time and eat then head up to meet the locksmith. We wait for an hour, locks picked, we discover the power is out. After that gets turned on Dan chats with the locksmith while I unpack. Our boxes got here but they're at the neighbours and he's asleep or not home. We left 19 hours ago, I'm done, gonna curl up on the floor and pass out!